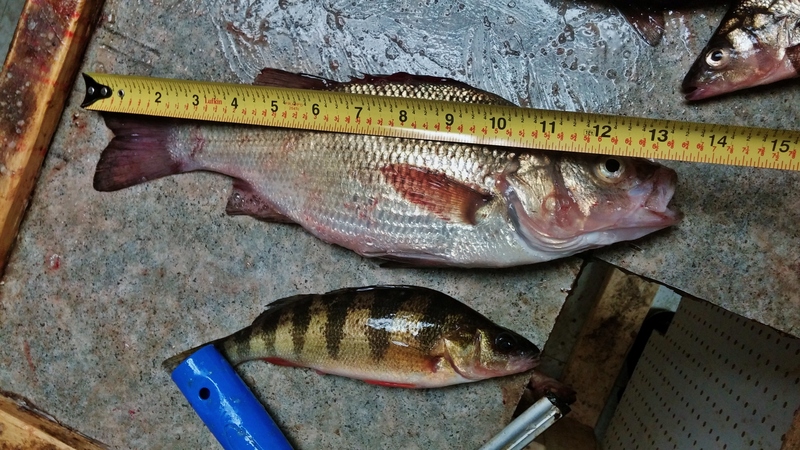 In general, white perch provide us with nothing but frustration. For this day, trying something new meant pounding on white perch for about half of our time on the water. They had been biting good all winter but with other bites and species occupying our time, getting after something different was appealing. The weather was less than ideal. Throughout the day, we got plastered by rain, snow, and sleet. Wind too! The day was a rough one but in the end it paid off. Getting on the water around 8:30, it took about 2 hours to consistently get on fish. After finding fish, the bite was good for close to an hour. Getting up and down quickly was very important to keeping the fish interested and not moving on. The main bait choices for the day were minnow tails and maggots. The maggots were about as nasty as could be without being hard but they worked. Also, we tried eyes, plastics, and small fillets of fish unsuccessfully. After the first run of fish, they disappeared. Over the next hour we picked and poked at fish moving out towards deeper water. After a slow hour, we hit them again. For the remainder of the day, one hole provided action as quick as the jig could get back down. After two hours of steady catching, all minnows and usable maggots were gone so it was time to pack up and head home. Nothing wrong with running out of bait by 3! Dlyan, in spite of the less than ideal weather conditions, that day the bite was good once we all found a hole to hang out at. It was nice meeting you in person and your friend Ben, and hope to catch you around sometime. Nice to meet you as well. I’m sure we will meet up again!